My daughter's HS volleyball team was playing in Oakland during the evening so I thought I'd find some summits to visit in Contra Costa County. I ended up playing around in the foothills west of Mt. Diablo on a selection of public lands managed by various state, county and city agencies. This small range is about three miles across and less than a mile than in width, little more than a longish ridgeline rising between Sycamore and San Ramon Valleys. Part of the Sycamore Valley Open Space Preserve, it is managed by the East Bay Regional Parks District. Access is not obvious. The three entrances are located at the end of cul-de-sacs in residential neighborhoods. Only the one on Northview Ct offers parking for more than a few cars. There are probably few park users other than the surrounding neighbors. The treeless hills are open for hikers, cyclists and small herds of marauding cattle. I used the residential pathway off Woodside Drive that crosses Sycamore Creek before connecting with the open space area. The dirt trail/road then climbs to the summit ridgeline, going over the highpoint, a total of 20mins' effort. A cow trail on the return made for a nice shortcut. Less than two miles north of Sherburne Hills is the smaller Hemme Hills, about 1/3 the size. The highpoint and surrounding slopes are adjacent to, but not part of the Sycamore Valley Open Space Preserve, yet appear open to public access. The hills overlook the very exclusive community of Blackhawk and are located immediately west of the Blackhawk Country Club. A decorative fence along Blackhawk Rd north of the highpoint seems more for appearances sake than to keep people out of the hill or deer off the roadway. I parked in a small lot associated with the Blackhawk Lacrosse Field across the road, walked to the northwest end of the fence and then climbed the hill via a plowed firebreak. Partway up the hill I went by what was probably a scenic overlook site from the days when this area was part of the 1200 acre Blackhawk Ranch before it was sold to developers. A weathered seating area under a few shade oaks has been left unprotected from the elements to decay in a few more decades. All of 15min were required to climb to the unassuming highpoint. I drove into Mt. Diablo State Park ($10 fee payable to the cheerful volunteer at the entrance booth at the South Gate or stealth it through the Northwest entrance). Aside from my $10 fee, the entrance attendant seemed most interested in making me aware of the high bicycle traffic in the area. Kudos for caring about something that actually matters. I drove to a picnic site at Rock City for a short hike out to Artist Point, found along Fossil Ridge. The Artist Point Trail is across a small draw and it wasn't clear to me if Artist Point was the hill I climbed (perhaps painted by folks from the trail?) or a point along the trail. I went with the BGN/USGS location shown on my GPSr. An unsigned use trail leads to the small bump along the ridge with about 65ft of prominence. It overlooks the Mt. Diablo Rd and points to the west and north. About a 5min hike. This unwall-like summit is found a little more than a mile northwest of Artist Point. The dirt Wall Point Rd runs across the ridgeline and between the twin summits. The west summit has the feature designation on the topo map but the east summit is higher. Bikes and equestrians are welcome on this old ranch road. To access it, I started from a small turnout along the Summit Trail northwest of Buckeye Campground. A connector trail took me from the Summit Trail up and over a small hill (actually higher than Wall Pt) and down to Wall Point Rd. The road runs east and above Sentinel Rock, a defining feature of Rock City. Had I known how cool it looks I would probably have paid it a visit while I was at Artist Point. I followed the road to the saddle and then a use trail of sorts to the higher east summit. Trees (and some poison oak) are found at the hgihpoint, hampering views. A very non-interesting summit. Shown on the park maps, this small rock outcrop is actually located on one of the few private inholdings within the park and found just inside the Diablo Ranch gate. An exceedingly short hike of less than a minute gets you easily to the top with a view overlooking the ranch and surrounding countryside. This is the highpoint of a small rockclimbing area within the park near the northwest boundary, overlooking Pine Canyon. There is TH parking at the park boundary, probably the easiest approach to Castle Rock. A perhaps more interesting approach can be made from Diablo Foothills Regional Park to the west. I followed more biking/hiking/riding trails/roads in a circuitous manner to a ridgeline before the road drops down to Pine Canyon. A single-track here with a sign warning of a Spring nesting closure leads northwest along the ridge to the highpoint. A pair of turkey vultures were commanding the highpoint and a nearby rock feature when I arrived, the one seeming incensed that it was required to vacate its perch. The rock required some modest class 3 scrambing to scale, all of 10 feet's worth. I occupied the rock for only enough time to snap a few photos before relinquishing it back to its rightful owner. I followed the continuing use trail through the oak understory to the north to reach the park boundary, then cross-country down grassy slopes to the original trail. This shortcut made for a quick descent of less than 10min following the 30min ascent. Leaving the park, I next drove through Walnut Creek back to Interstate 680 and Sugarloaf Hill Open Space. This small, mostly undeveloped park is managed by the city of Walnut Creek. The main staging area is found on the northeast side along Youngs Valley Rd, but I used a harder to find entrance at the end of Grover Lane due to insufficient research. The lower north summit has a benchmark (as depicted on the topo, though I didn't find it) and a couple of cell towers. 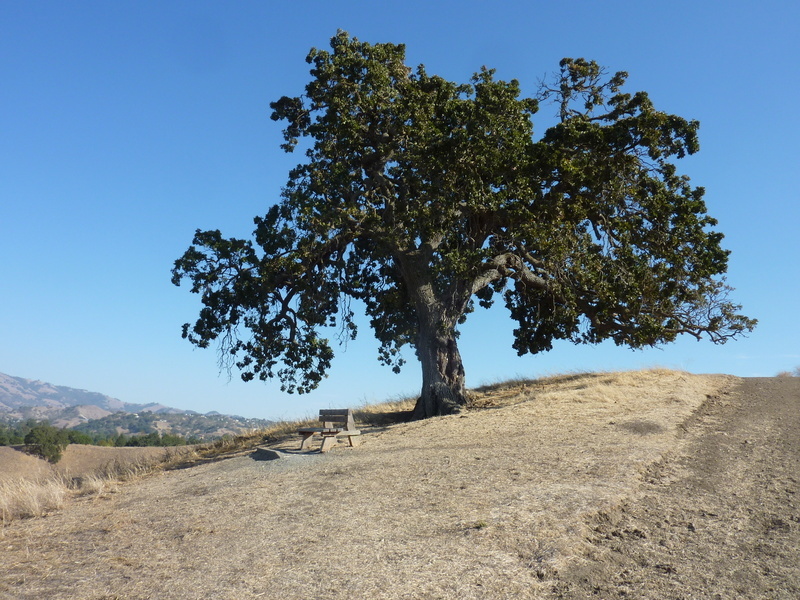 The higher south summit is found under a few stately oaks along the ridgeline overlooking the interstate and Walnut Creek. I spotted a coyote trotting in the opposite direction, looking for a place to hide. It seemed a difficult spot for it to be located in the center of a dense urban/suburban environment and I wondered if it was comfortable in its restricted habitat or questioning where it took a wrong turn. The main entrance has numerous picnic sites, an orchard and some antique ranch and farm equipment on display.